Follow our mission as we develop the knowledge that will prove critical for human safety and productivity on the surface of Mars. 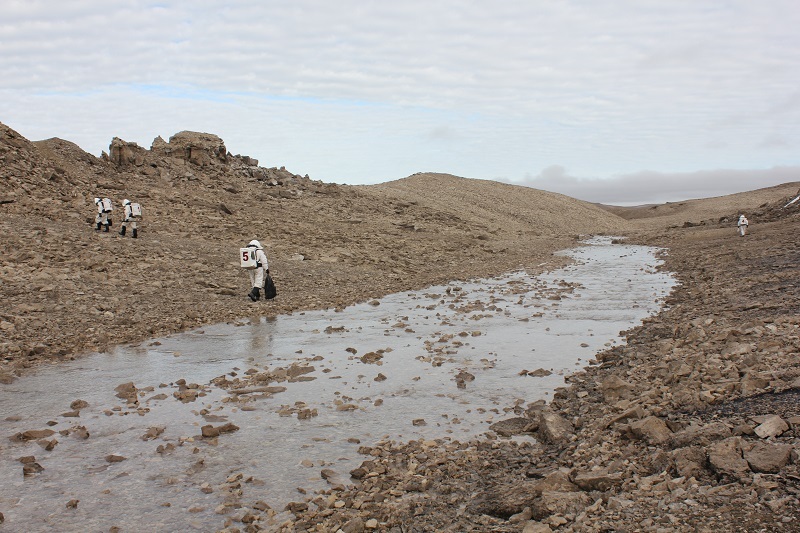 Our crews at FMARS are required to conduct a sustained program of geological, microbiological and climatological field exploration in a cold and dangerous remote environment while operating under many of the same constraints that a human crew would face on Mars. 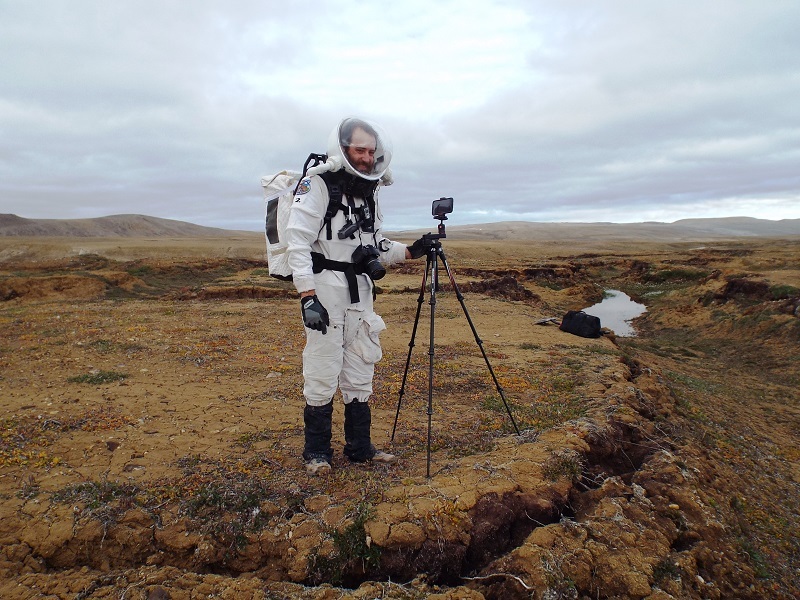 It is only under these conditions, where the crew is trying hard to get real scientific work done, while dealing with bulky equipment, cold, danger, discomfort, as well as isolation, that the real stresses of a human Mars mission can be encountered, and the methods for dealing with them mastered. It is only under these conditions that all sorts of problems that Mars explorers will face can be driven into the open so they can be dealt with. 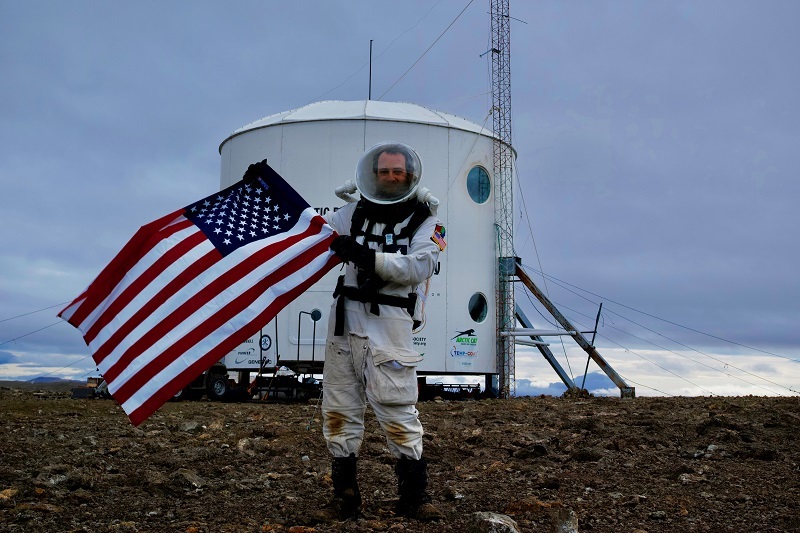 Only by doing these missions can we make ourselves ready to go to Mars. Nothing like this has ever been done before. 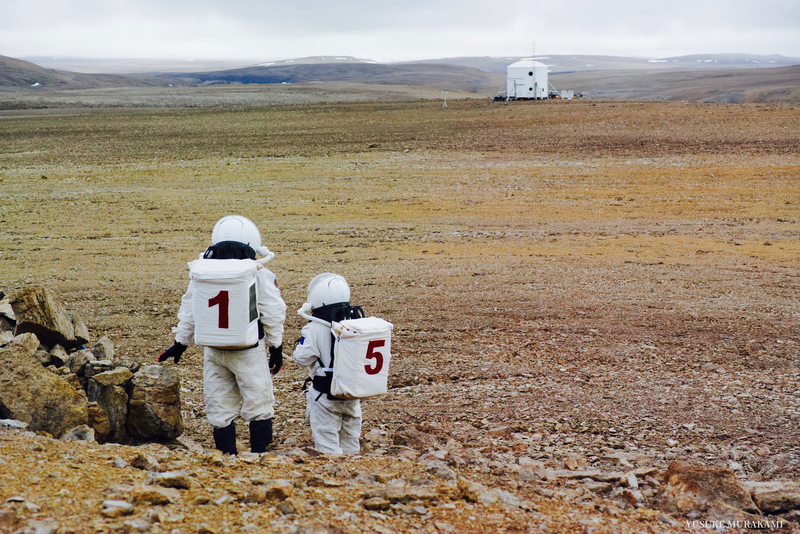 This is the final expedition of the Mars 160 program. 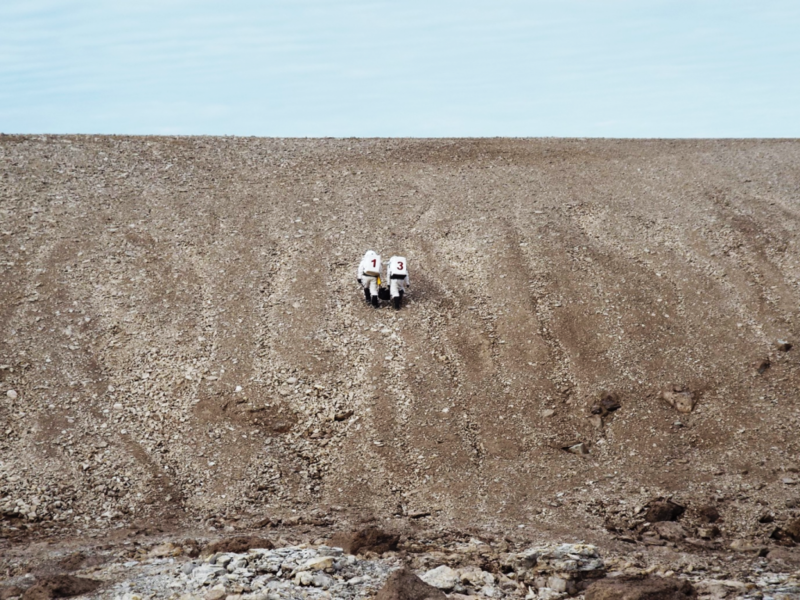 We are 6 people living in the F-MARS, in the High Arctic, far from home. Over here we can only rely on ourselves. 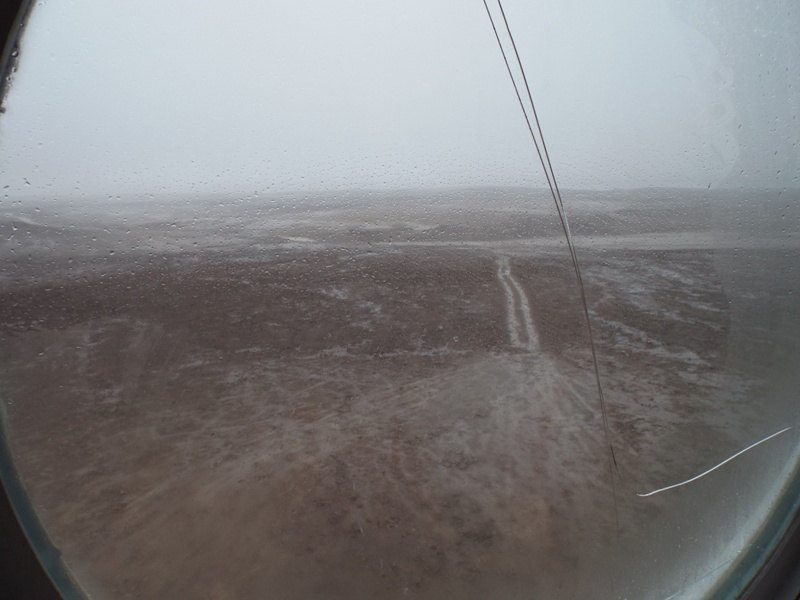 The nearest city is Resolute Bay, 1 hour of flight from the station. 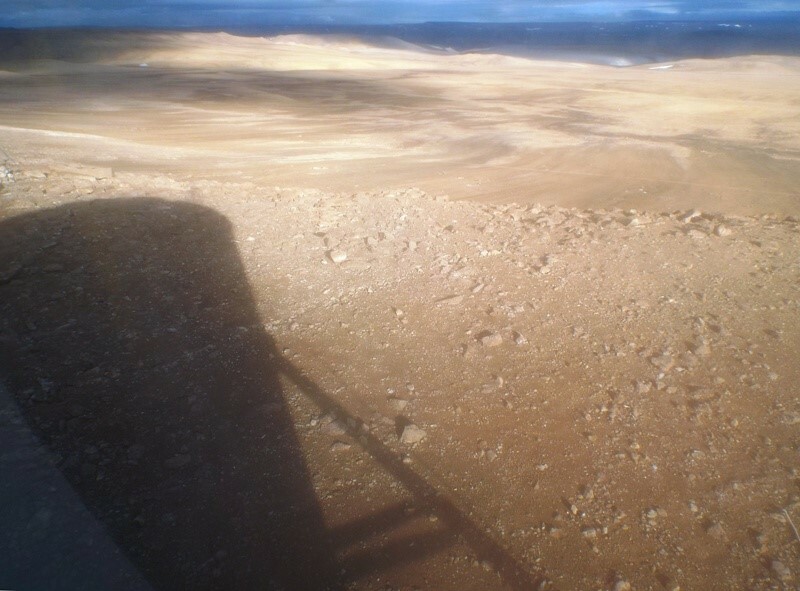 Resources are also more limited here than at MDRS, especially power. This imposes a limit on what we do and when we do it. To conserve fuel, the generator is ran 9 hours a day, with gaps up to two hours. When the generator is off, there is no heater, no comms, no cooking. Hopefully we all have laptops that can ran for few hours on the battery, allowing us to keep working. During comms windows, Internet is our only regular way to communicate. Satellite based communication imposes new constraints on how we use it. The bandwidth of few kB/s and the latency rarely below few seconds, if not losing the satellite signal, does not allow us for much more than emailing with the remote team and our relatives. 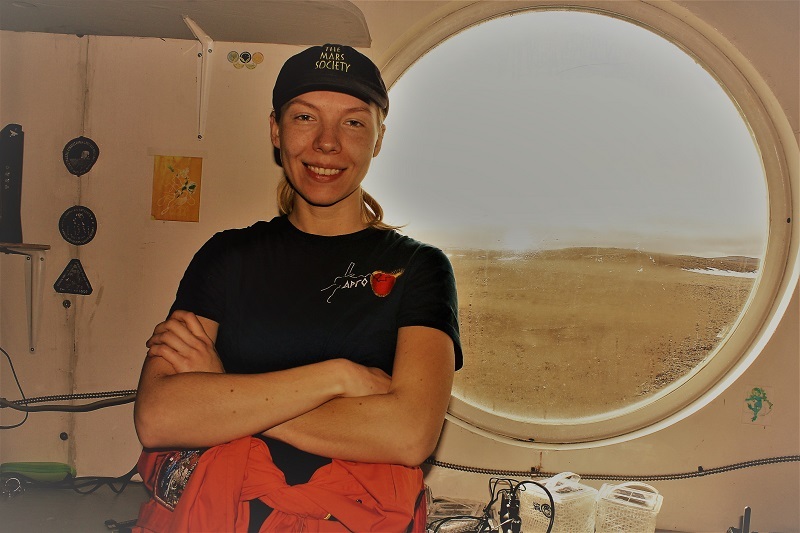 After this expedition got delayed by more than 3 weeks due to bad weather and ground conditions that prevented us to land on schedule, the mission objectives had to be redefined under the new time constraints. 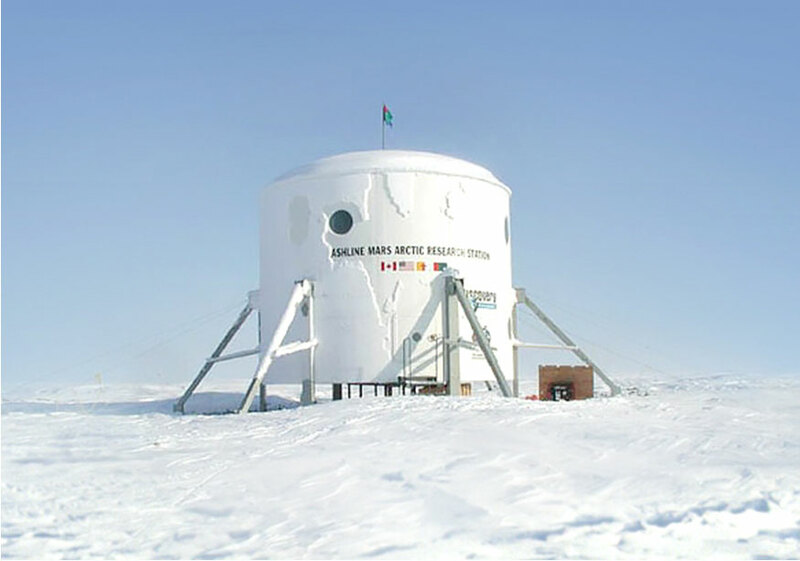 Therefore, no engineering project is conducted during this expedition. 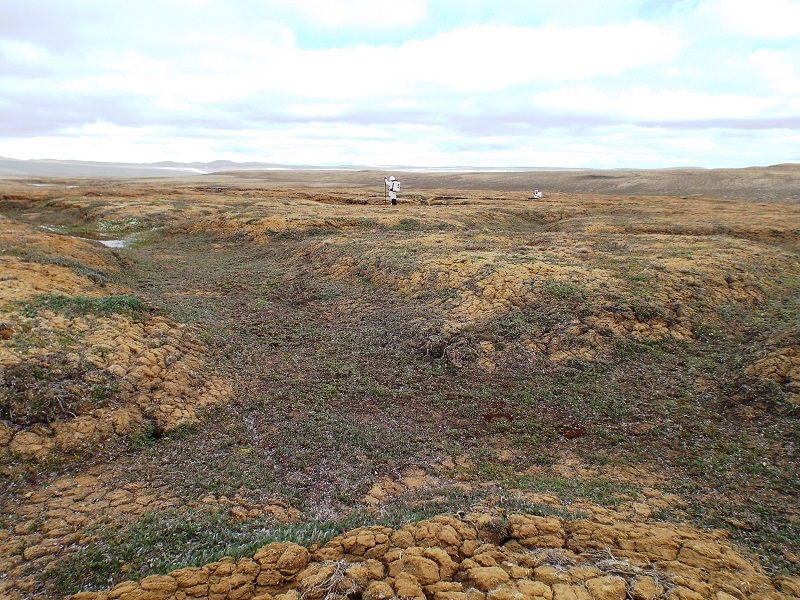 The unique features of the field gives priority to the field science activities over all the rest. That is why we have directed all our efforts to fulfill as many field science objectives as we can. 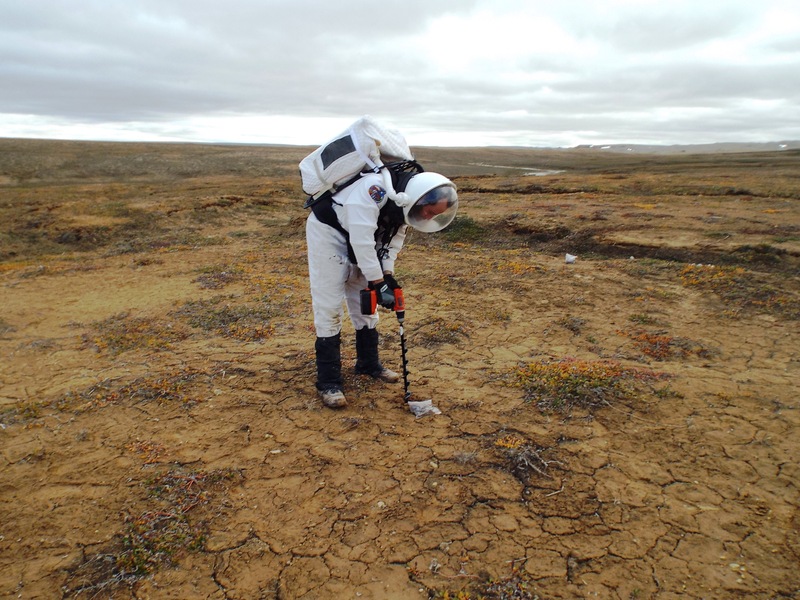 Biological exploration here at FMARS involves an array of themes, from documenting the Arctic flora to investigating biosignatures in ancient evaporite rocks. 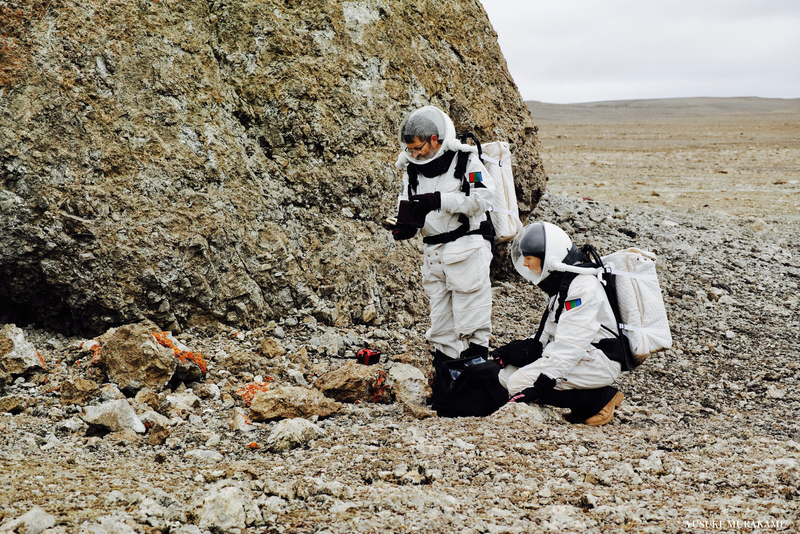 To test the efficiency of science operations on Mars, our scientific work is supported by Earth-based scientists. 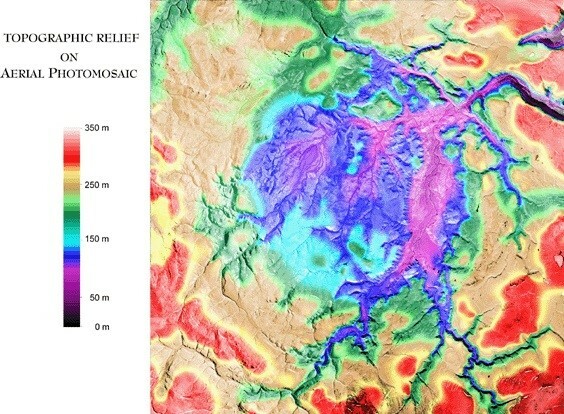 Hydrothermal sulfate deposits from the Impact supersite which is located near the middle of the Haughton crater have been sampled to investigate any viable or fossilized signatures of life originated and thrived during impact-induced hydrothermal event in the past. 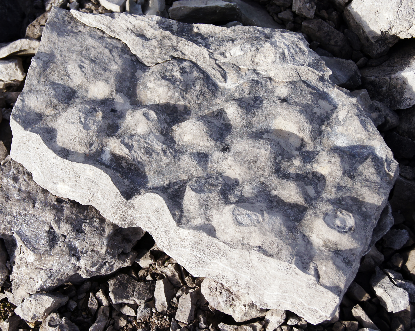 These gypsum-bearing evaporites from outcrops belong to the mid-Ordovician Bay Fiord Formation (39 mya). 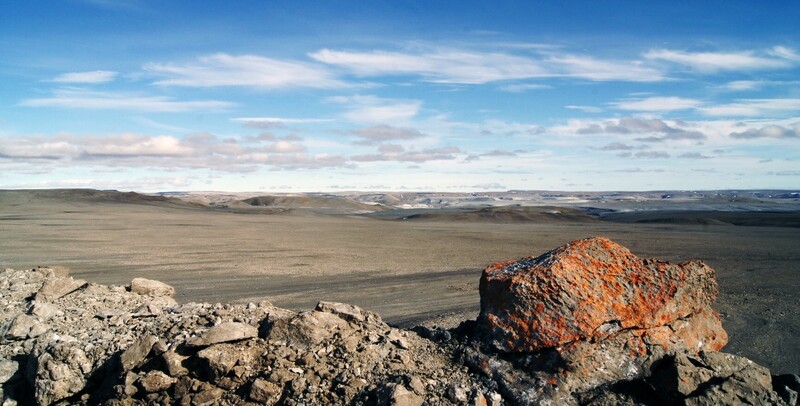 In the Bay Fiord Formation the gypsum was deposited through evaporation of seawater. Elsewhere in the crater gypsum is known to have formed as a result of the impact driven hydrothermal activity. Both the processes are considered to be analogous to the sulfate precipitation from the low-temperature aqueous fluid on Mars. 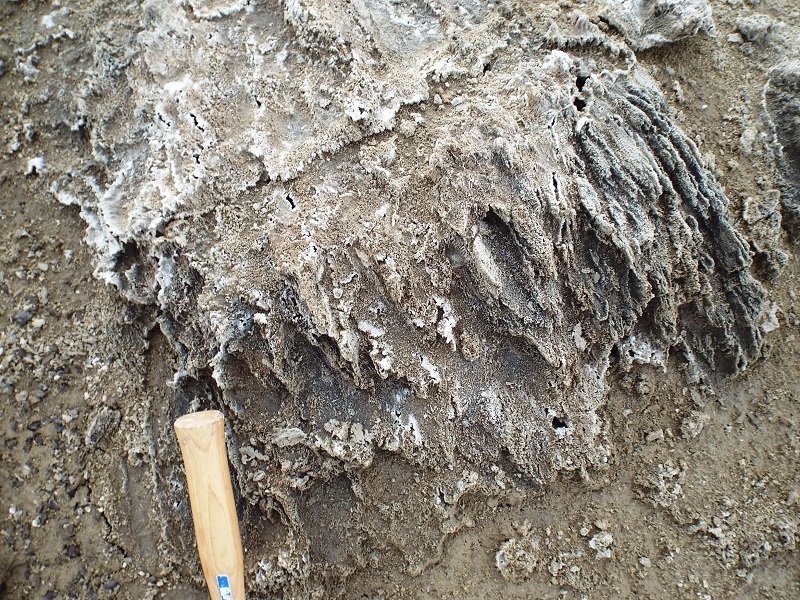 So, any microbial life that was present in the brine could have found refuge in tiny fluid-inclusions of the gypsum crystals in the past or potentially left their marks in the depository layers while degradation. 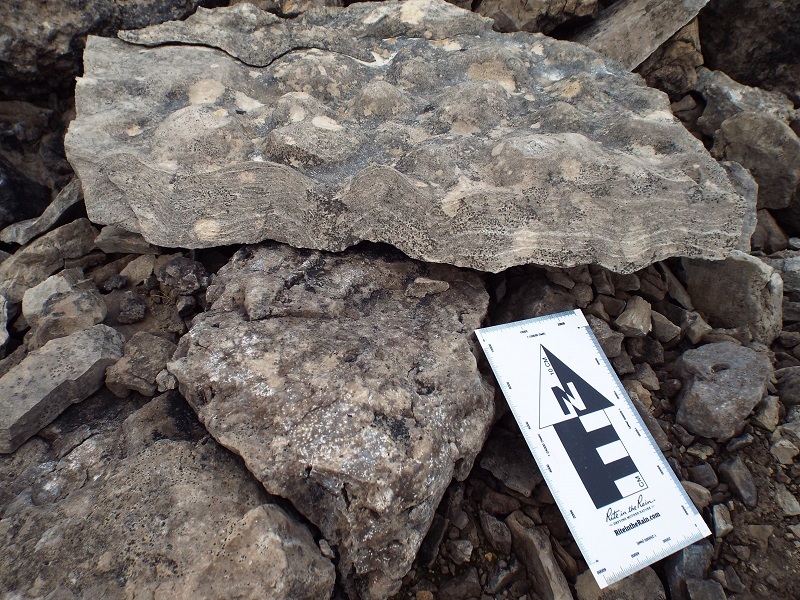 Hence, it is fascinating to explore the idea of preservation of biomarkers in evaporite rocks. In order to assess the positive and negative influences of various feature of the mission, the crew is conducting a guided debriefing at regular intervals. 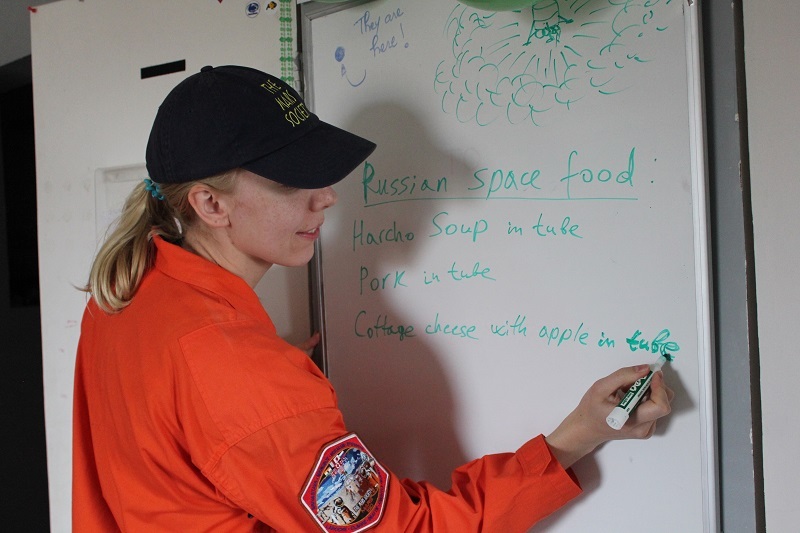 This includes individual brainstorming of the main issues experienced by each crewmember, categorized them and finally having a group brainstorming to resolve the most important ones. These session have been found very insightful for crewmembers. Sharing our issues with the whole crew and working all together toward a solution is a crucial activity for building a strong and cohesive team. 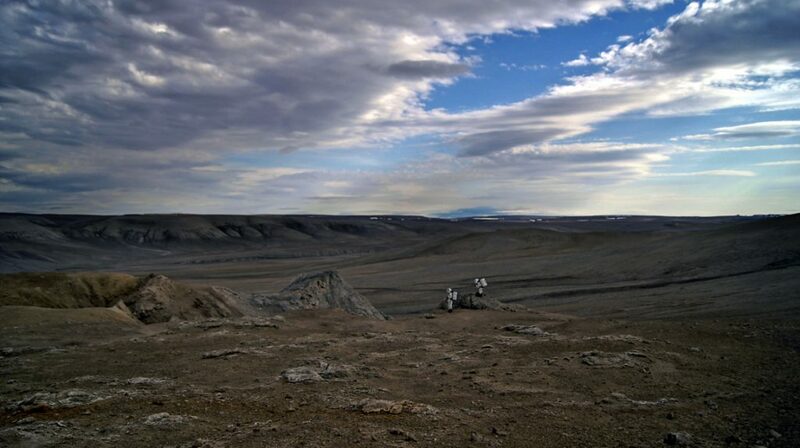 This is a critical group feature for crews operating under extreme environment such as Mars. 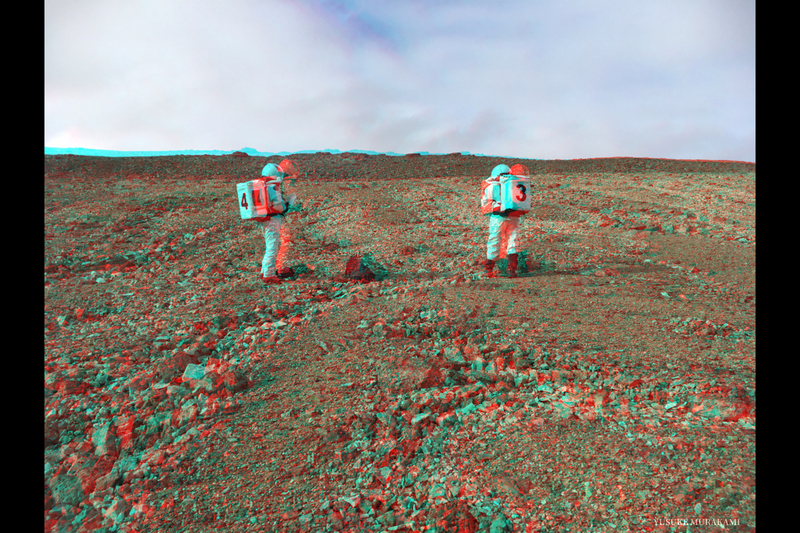 The Mars 160 program and this expedition in particular has been supported by Earth based scientists: Dr Kathy Bywater, NASA Ames Research Center – USA Dr Vincent Chevrier, University of Arkansas, USA – Prof Charles Cockell, University of Edinburgh, UK – Dr Alfonso Davila, NASA Ames Research Centre, USA – Polina Kuznetsova, Institute of Biomedical Problems, Russia – Dr Chris Mckay, NASA Ames Research Centre, USA – Dr Rebecca Merica, University of Nevada, USA – Dr Irene Lia Schlacht, Politechnico di Milano, Italy – Dr Matthew Siegler, Southern Methodist University, USA – Dr Hanna Sizemore, Planetary Science Institute, USA – Dr David Wilson, NASA Ames Research Center, USA. 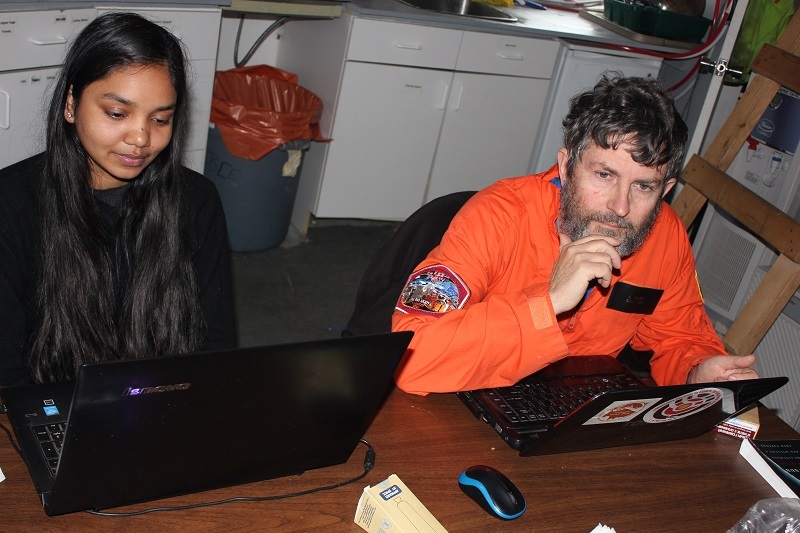 As Principal Investigators: Dr Shannon Rupert, The Mars Society, USA – Paul Sokoloff, Canadian Museum of Nature, Canada. As The Mars Society president: Dr Robert Zubrin, USA. am calling this a daily report, rather than a sol summary. temperature had dropped to -3 C and the puddles were all frozen. Busy day today preparing to leave. Packing bags as much as possible. 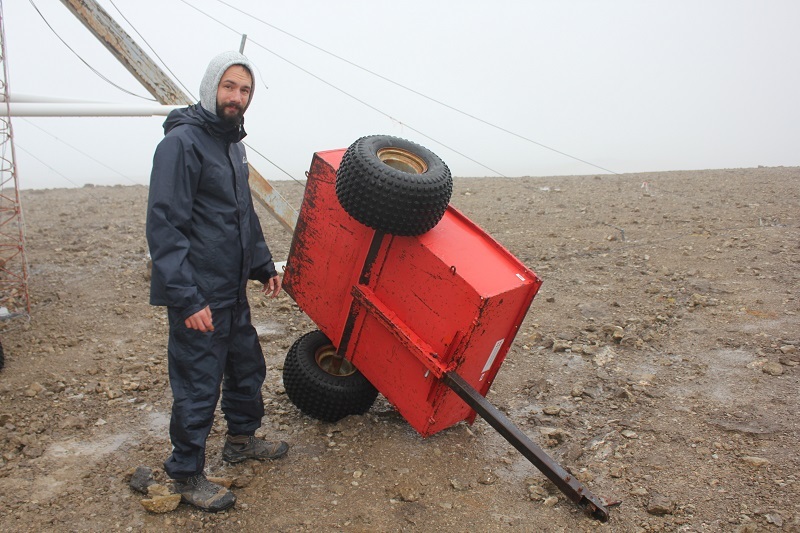 trouble leaving the Arctic as he and his crew did the Antarctic! Many of you might think: “Why they have to make all the way to the Arctic, where it is risky, expensive and unreliable? Why not do it the same way as Mars-500, where the station located in the middle of the city, but fully isolated and had a small simulation of Martian surface for a short EVA. 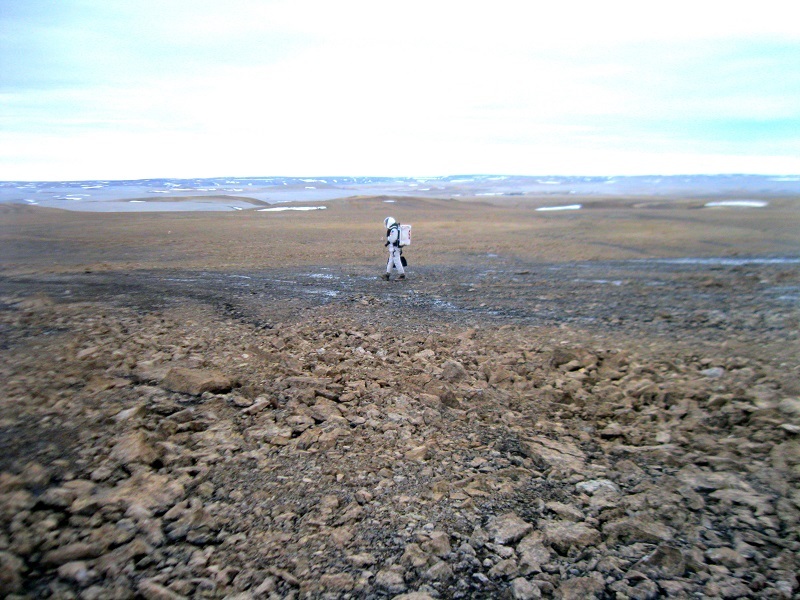 Mars 160 mission chose a different path among the mars analogue missions. In our simulation the field science comes first, second is isolation and third operations. 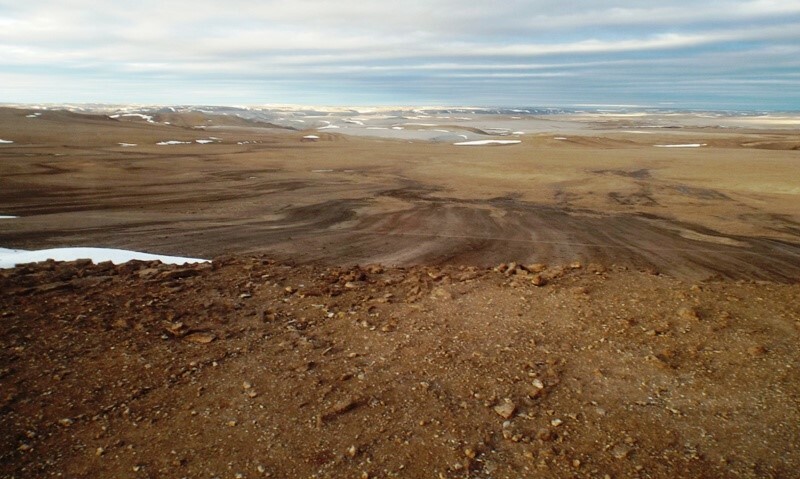 Devon Island and Utah desert have many similarities with Martian geology. 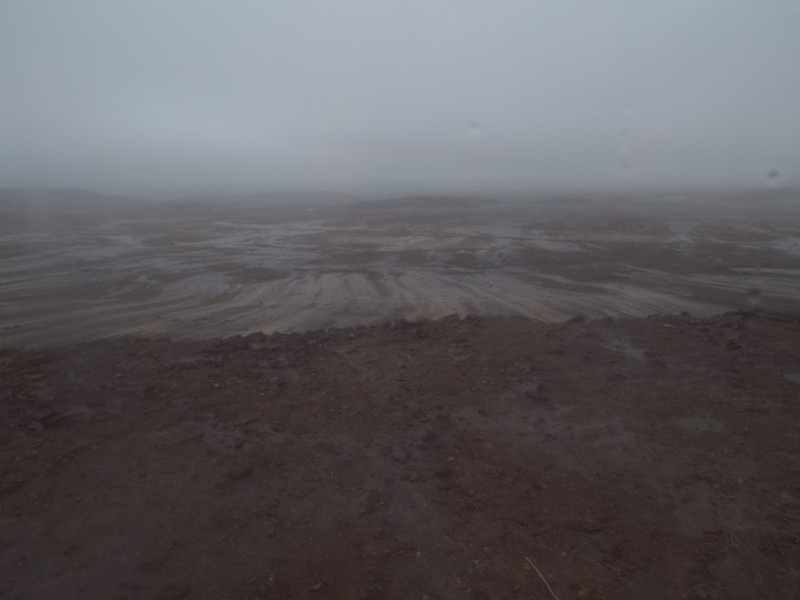 Devon has an impact crater, permafrost environment, gypsum deposits and desert climate. In Utah: gypsum deposits, desert climate, clay minerals and sand dunes. 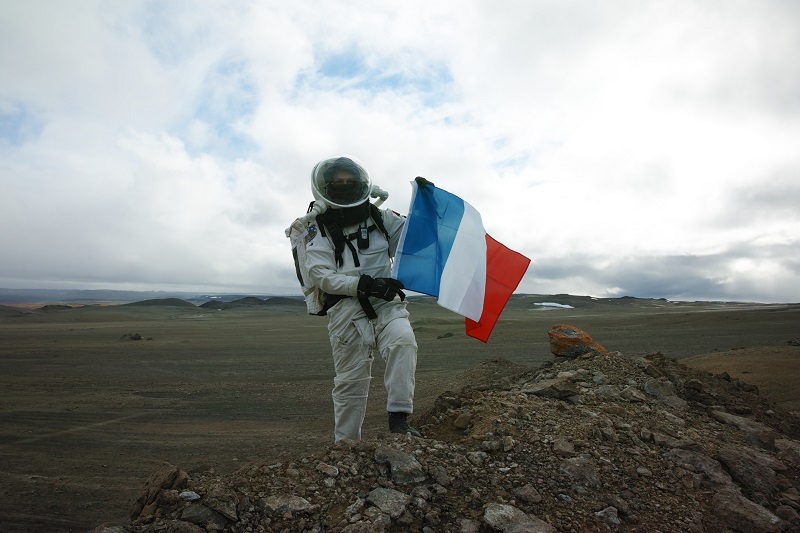 The main goal of our mission is same as it would be on real Mars mission – finding the traces of life or life itself. 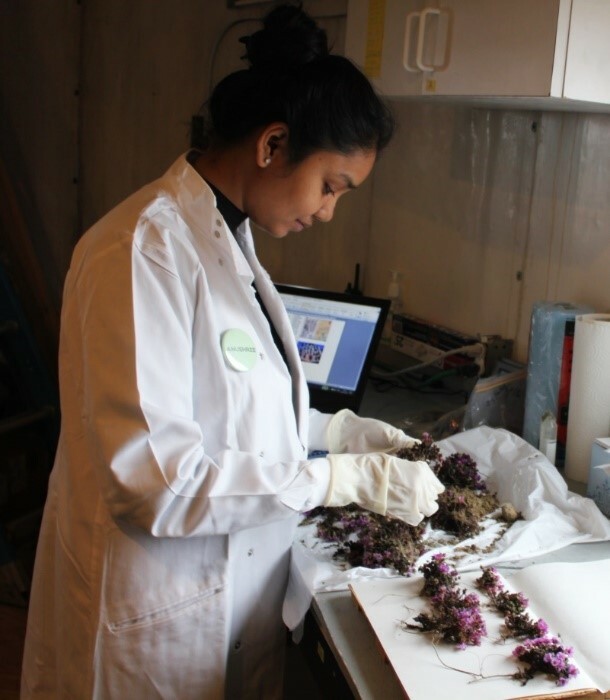 The crew biologist Anushree Srivastava has all the weight on her shoulders. She is responsible for five microbiological research projects but only two of them can correspond with real Mars mission. The hypoliths are photosynthetic organisms that live underneath translucent rocks in climatically extreme places. 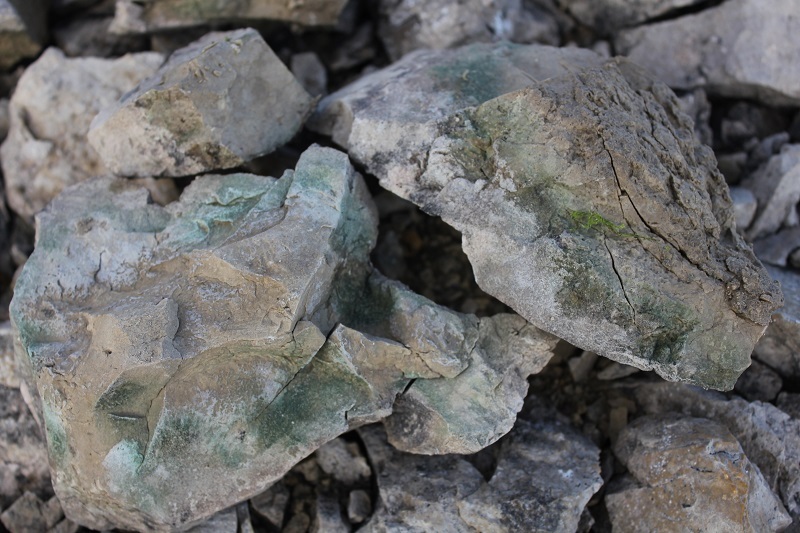 The rocks are generally translucent (quartz) which allow hypoliths to receive light, moisture from the substrate and the soil underside. 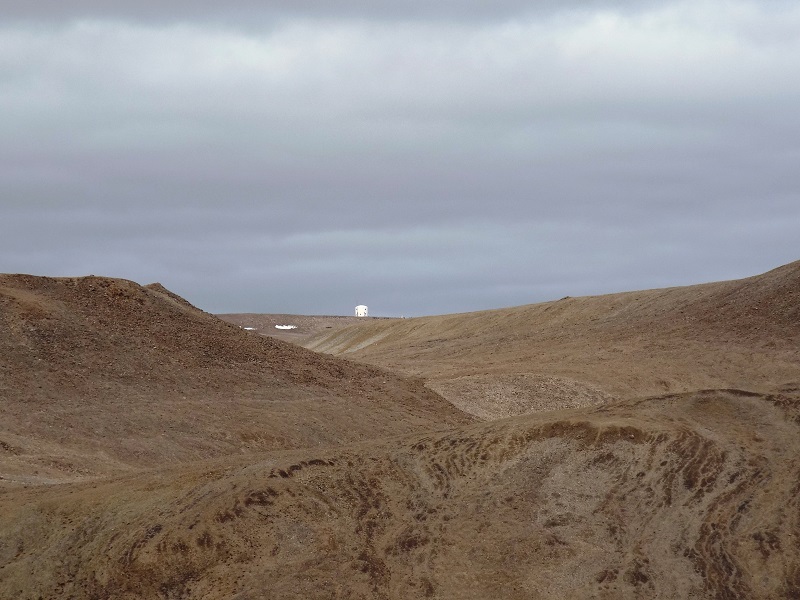 During our fieldwork in Utah we tested that it is correct, but at Devon Island the hypoliths follow different path. They live under the limestone. Rock protects hypoliths from harsh ultraviolet radiation, desiccation and extreme temperatures. 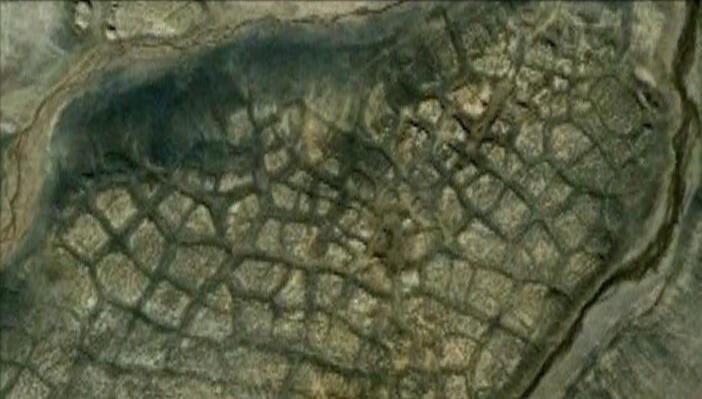 There is a big possibility to find microorganisms living underneath the Martian rocks. 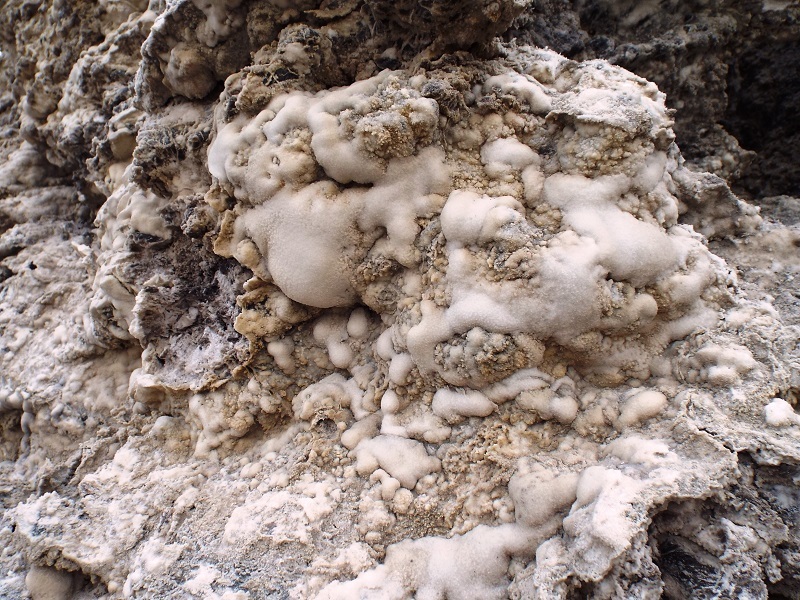 Another important research is finding traces of microbial life trapped in ancient evaporites such as gypsum (hydrated calcium sulphate). Those microorganisms are halophiles. Halophiles (in Greek word for “salt-loving”) are organisms that thrive in high salt concentrations. They can be found anywhere with a concentration of salt five times greater than the salt concentration of the ocean. 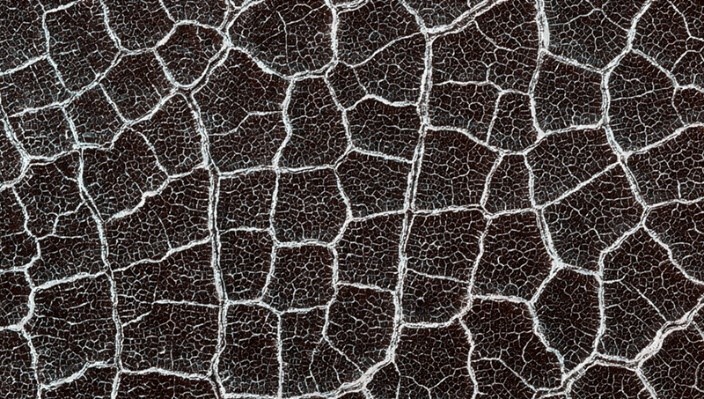 As Anushree says: “On Earth photosynthetic life has been found to be encapsulated inside hydrothermal sulfate rocks. On the other hand, ancient gypsum may also host the sings of primitive life that was living in the liquid water and got buried during crystallization. If not viable, we may find the trace of past life that left while degradation. So we are interested in investigating gypsum from that perspective. 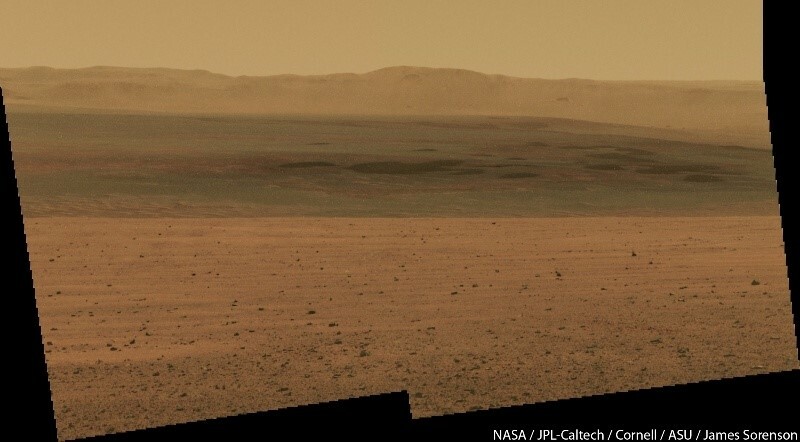 Since the presence of gypsum has been confirmed on the surface of Mars, there is a possibility to detect similar signs of life in those deposits”. 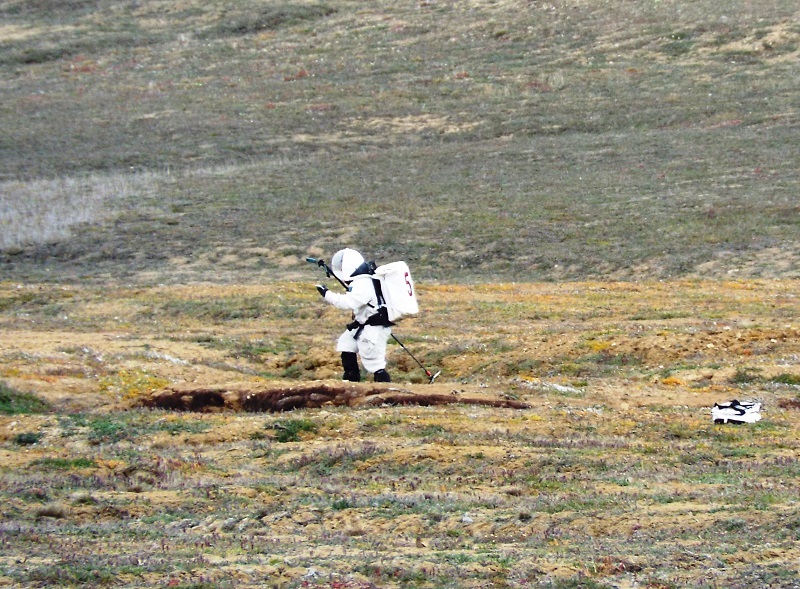 Three other biology projects have less chances of be repeated on Mars, but have operational advantage in analog environments. 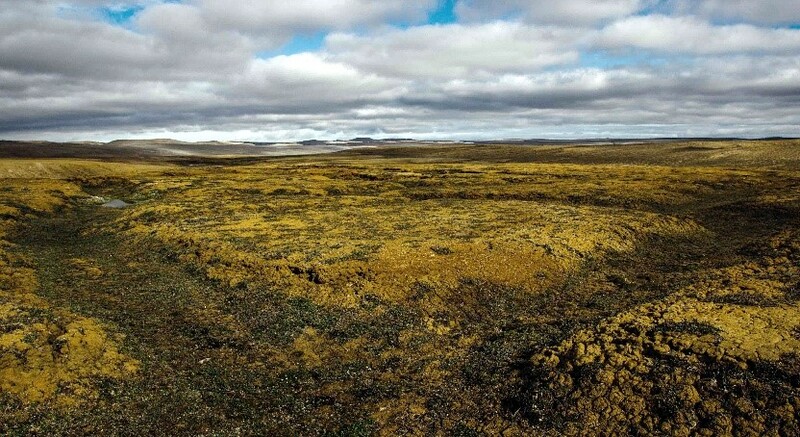 Mapping and surveying of Lichen biodiversity; documenting the Arctic flora and studying associated microbiome; studying different communities of Algae in the Arctic environment. It is fascinating to participate in these projects via assisting Anushree during EVAs. To discover micro life in such a hostile world. To watch how it fights for the place under the sun. To look at our planet from a different angle. This is why the science comes first! Big and successful sol today, rounding off our EVA campaign. We were all up early to greet the day, though to the dawn. Dawn does not happen until the 15th. It was breezy, with low cloud, but no rain. Good EVA weather. 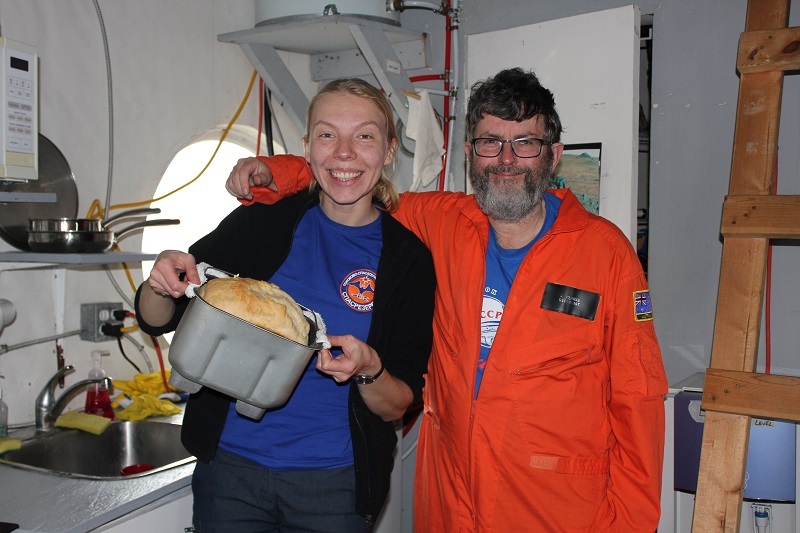 The first EVA team – Paul and Yusuke with Anastasiya riding shot gun – were out the hatch by 8 am. 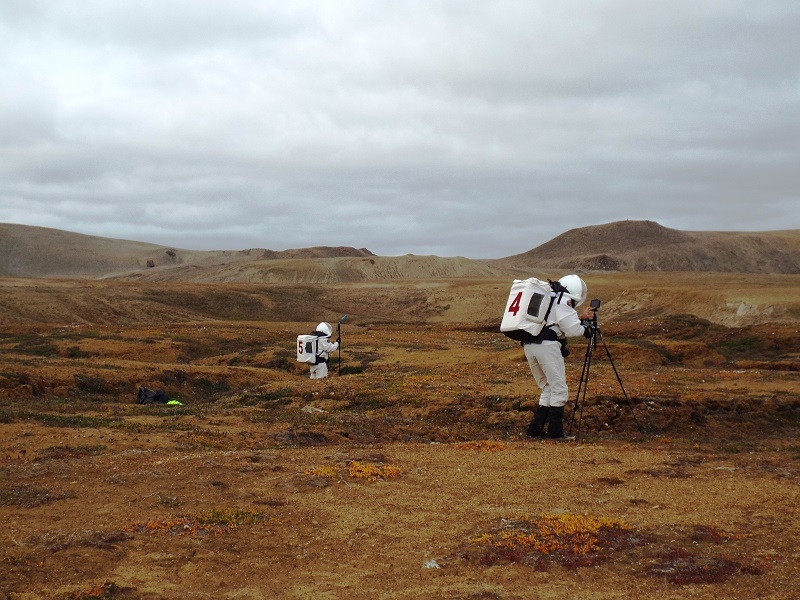 They revisited Paul’s mega polygon site to collect more data and samples. 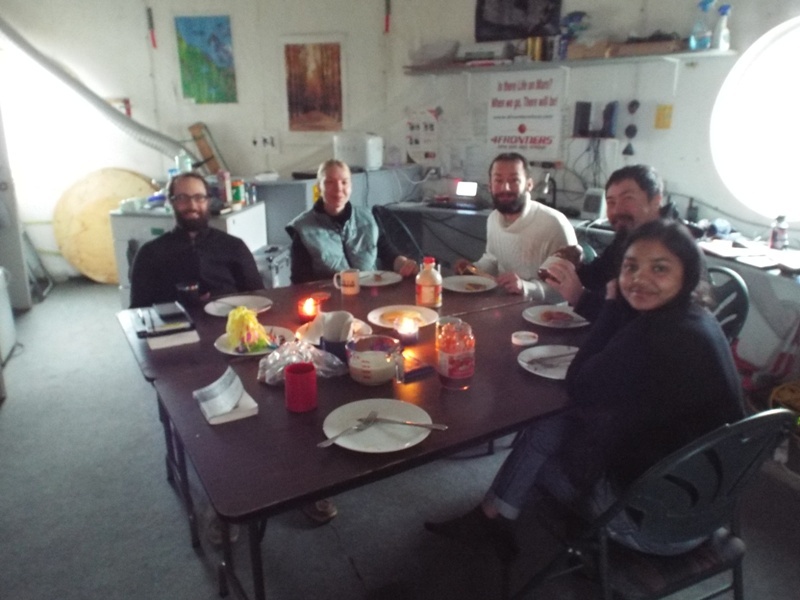 They were home by 12, by which time the second team was lunched and ready to go. Soon after 1 pm Anushree and I, with Alex as shotgun, departed for a long drive down to the centre of the crater in search of an additional site for gypsum sampling. 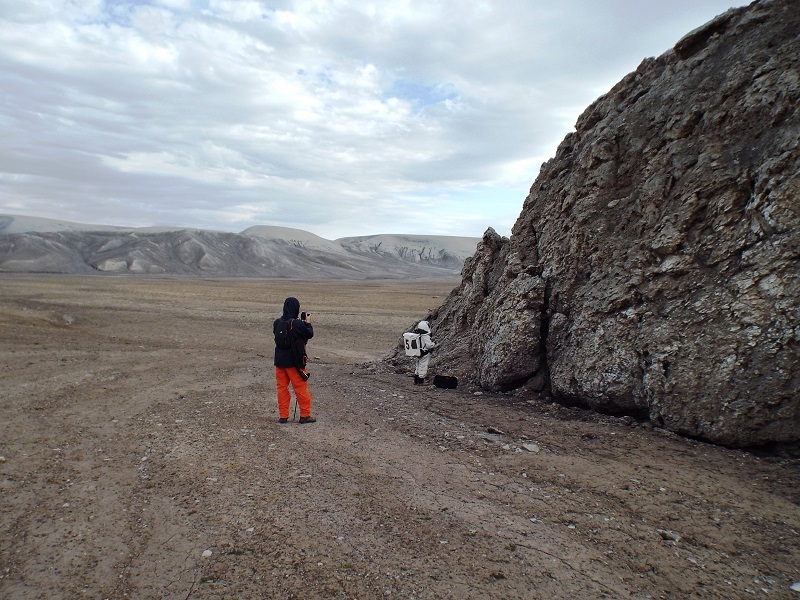 Working off the geology map we located an outcrop of the gyosum-bearing Bay Fiord Formation. This turned out to be a mega breccia outcrop, presumably formed by the impact that formed Haughton crater. 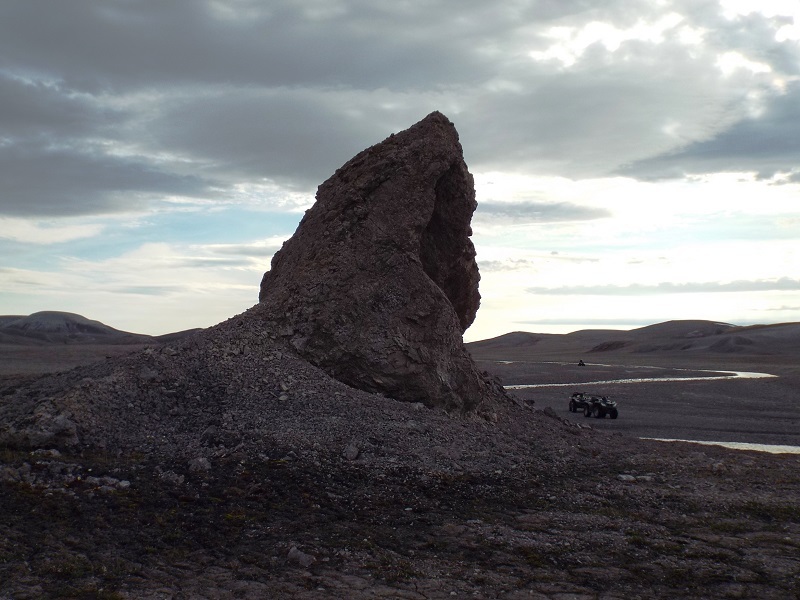 A fascinating outcrop, well worth the drive. 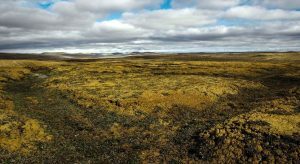 It was capped by the presence of a seam of ice in a fracture at the base of the outcrop. We were also rewarded by the sun breaking though and some magnificent sunlit views of the centre of the crater. On the way back was ruminating on our time here. Felt rather sad that this was out last scheduled EVA. 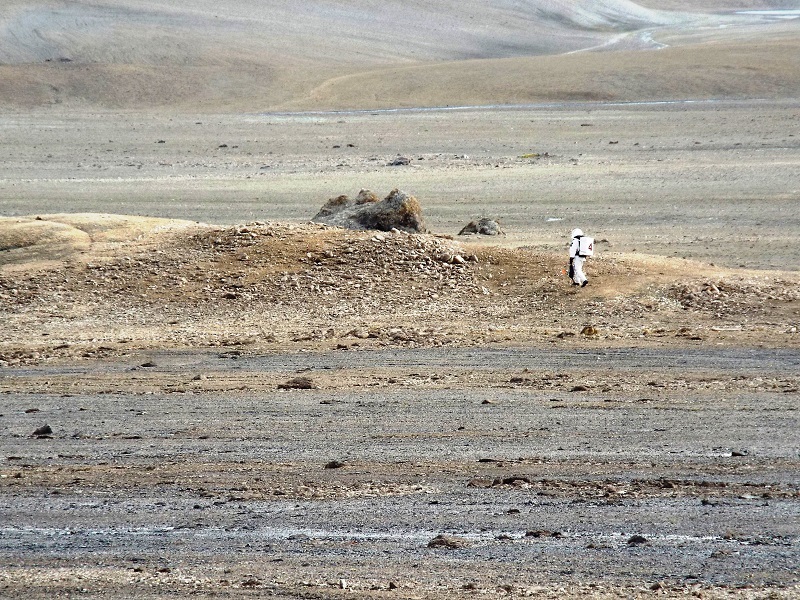 We are just getting into our stride, building confidence in the terrain, our skills, and our equipment to carry out longer and longer EVAs into the crater and its surrounds. Of course, if we had been here for two months we would probably feel the same. If only we could stay longer. 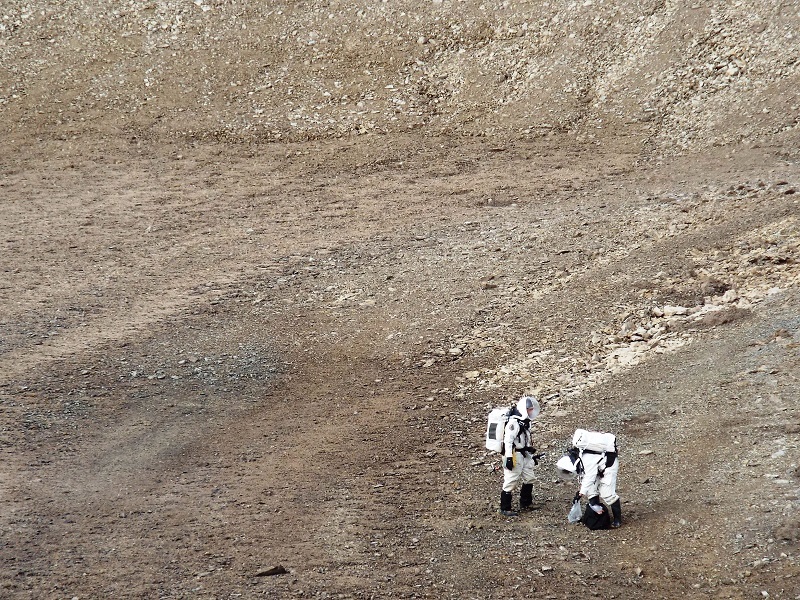 No doubt future astronauts on Mars will feel the same when it is their time to leave. Our experience does highlight the value of longer (one to one and a half Earth years) as opposed to shorter (30-60 days) stays on Mars. Tonight we feel weary but very pleased with ourselves. We will watch “The Expanse” tonight, and tomorrow we can sleep in on a day off. Outside it can rain if it wants to, we won’t care. So long as it is fine for our flights out next week. Just as at MDRS my sleeping quarter is opposite one of the big portholes. Every morning I wake up with the view of this window to an alien world. But not always can you actually see anything beyond the transparent glass. The condensation inside the Hab makes all the portholes foggy. Several times per day, we wipe the glass from all the moisture. Our geologist Jon is the early bird. He wakes up first, goes out and turns on the generator, put the water to boil, turns on the heaters and checks his emails. The generator sound is as if an alarm for the rest of the crew and one by one people get out of their cozy bunks. The queue downstairs to the toilet, shaking from cold people, yawns and salutes of the “Good morning” – usual everyday morning procedures. Coffee and breakfast with dehydrated milk, cereals and quick oats brings people to life. Only then, people can start the briefing, which is work, cooking and doing the dishes schedule for the day. The daily routine consists of many awkward and rare for the civilized world procedures. Disposing of the grey water, which is waste from washing the dishes and showers, means emptying the special barrel outside into a pit some distance away. Usually at least two people do it, since the barrel is heavy. Burning the trash and our excrements in the incinerator is another exciting moment of our day. Yes, I can feel your question: “Burning the excrements?” Well, here we do our “number one and two” very differently than on Earth. Due to preserving the wild nature on this island, we have to follow these steps: pee into special funnel, which connected to another barrel outside. When the barrel is full, it will be loaded on the plane and flown out of the island. To prepare for the “number two” first take out small plastic garbage bag, place it in the toilet bowl, do the business, tie up the plastic bag with the goodies inside and put it into special poop barrel. From there we take it to the incinerator for burning. Easy right? Not as gross as it seems! 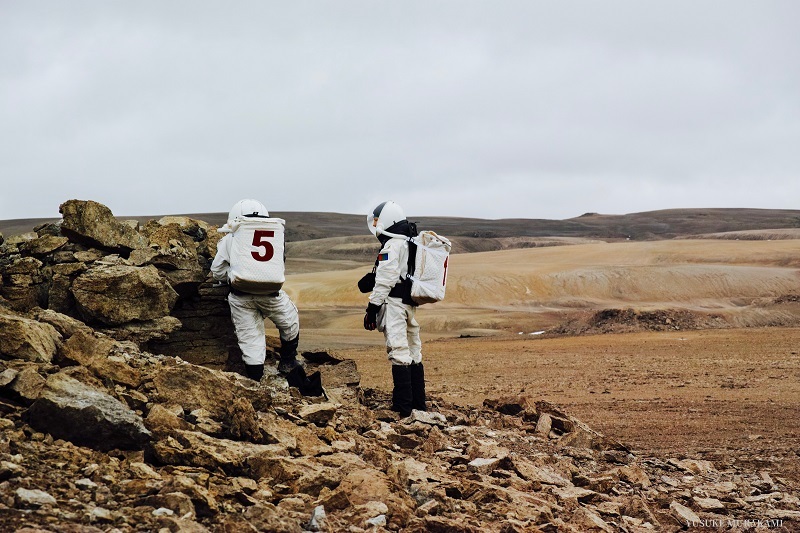 On Mars manned missions might use urine for extracting water and excrements for fertilizer. We didn’t go that far! Where do we get the water from? 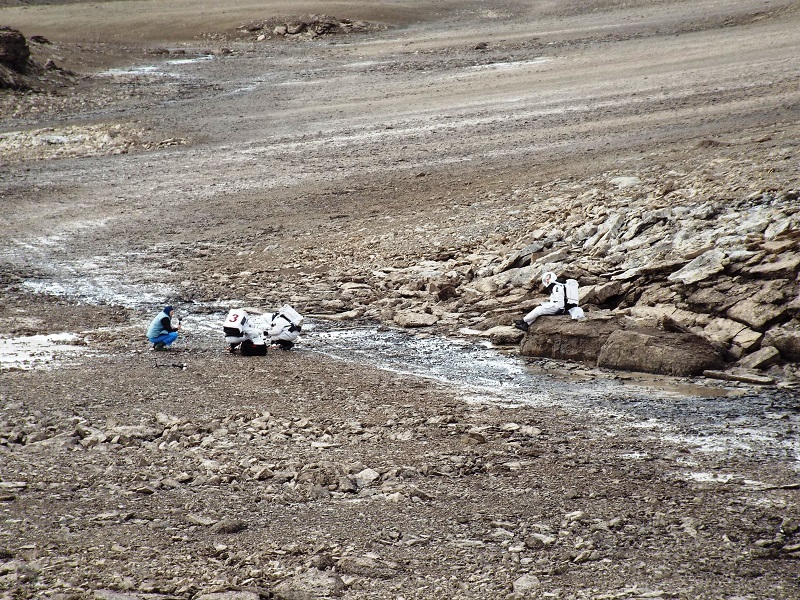 We fetch it from melt water rivers few hundred meters away from the Hab. Firstly the gun person or bear watcher goes out, checks if the area is clear, than we attach the trailer to one of the ATVs and hit the road. While two people fill the jerry cans with water, third one looks around for the danger – a bear. When water brought to the Hab, we place it to the barrel and from there it pumped to kitchen and bathroom. 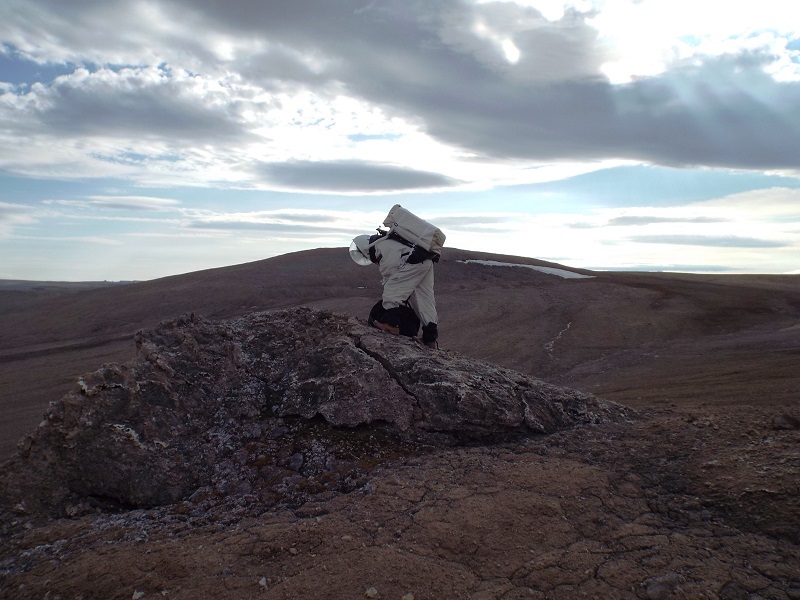 Just imagine where else you can say that you take shower and wash clothes in the pure arctic water. Don’t know if my skin rejuvenate after that, but it is good and clean! The EVA’s take the grand part of our day and usually last from two to five hours. Few hours each for cooking, writing reports, articles, and working in the science laboratory. We still have a little time left for ourselves. We watch twice a week a one hour TV series “Expanse” and a movie on our day off. Some read books, work with photographs and even sing. As for me, cheerful music in my headphones, feet on the wheel of the bicycle, which located in front of big porthole with amazing view to the Haughton crater. Where else in the world you can work out and observe the 39 million year old crater? Only here, the grand Devon island, the unique FMARS! Today dawned slightly foggy but it soon cleared up to be a nice sunny day, though still with a stiff breeze. Good EVA weather! In the morning we fetched water to replenish our tanks for the remaining three people who are having their weekly shower tonight. Today’s EVA went only a short distance into the crater, but lasted over four hours and achieved many goals. Yusuke and Anushree were suited, Anastasiya road shotgun. First Yusuke carried out a 3D scan of a field of sorted stone polygons, the same site trenched by Paul four sols ago. Aunshree collected hypolith data while he was going this. 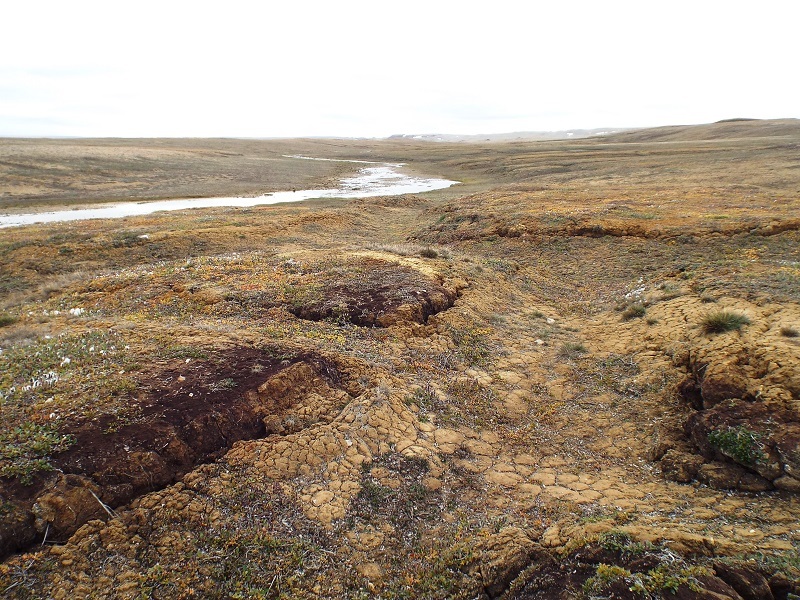 When this was done there was a quick diversion to an area of impact melt rocks for sampling. 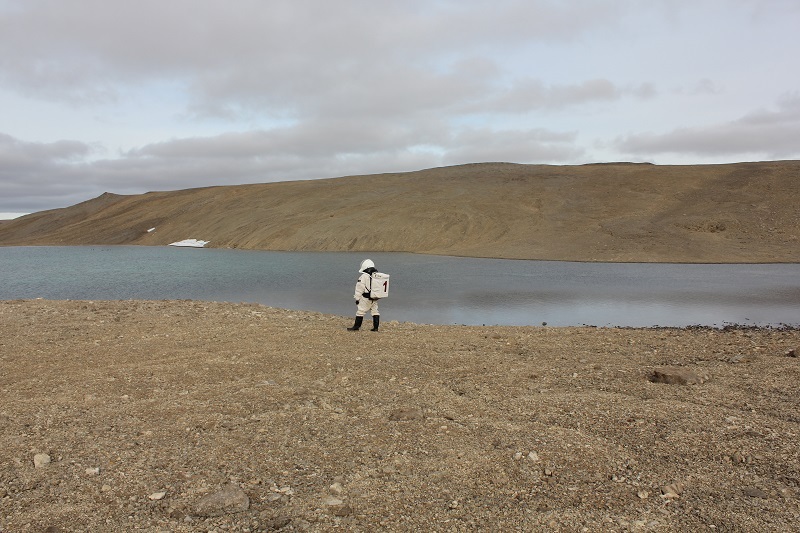 The team then made their way back to Lake Cornell where they collected further hypolith data. 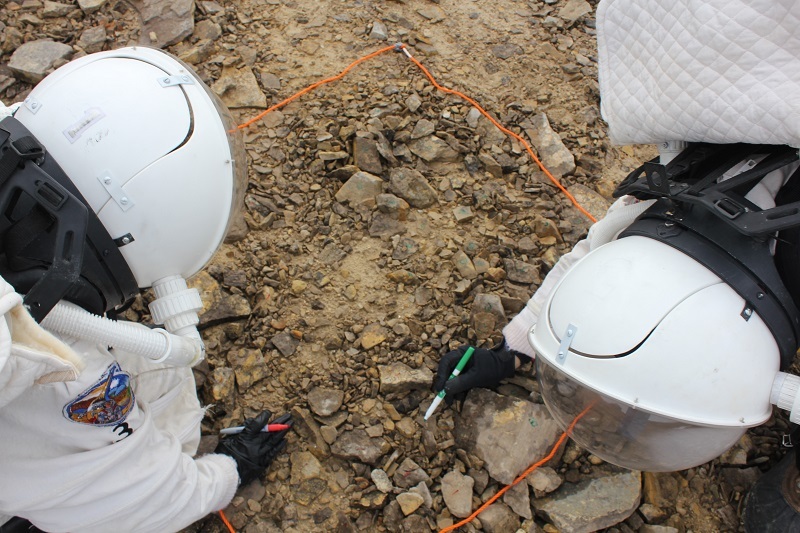 Their final tasks, back at the hab, was to sample the pink biofilms at the micro oasis just below the ridge crest. Tonight I made Palak Paneer and rice. We had an extended discussion afterwards to discuss how we will close out the station when we depart next week. Tomorrow will be a very busy sol. We are aiming to do two EVAs because of the expected bad weather coming on Sunday may preclude EVAs for the following couple of days. Until then it’s goodnight from me and goodnight from the rest of the crew. Still a bit of tension among the crew. We are pushing our limits and this is affecting the crew morale. Expecting bad weather Sunday and possible difficult conditions on Monday, we are going to have two 4-5 hours EVAs tomorrow. Sunday will be our last day off at FMARS. All systems running fine except the backpack charger which seems to have died. The LED do not light anymore. No voltage at the plug. I have not found other charger to replace it. As usual, nothing to report on this side. 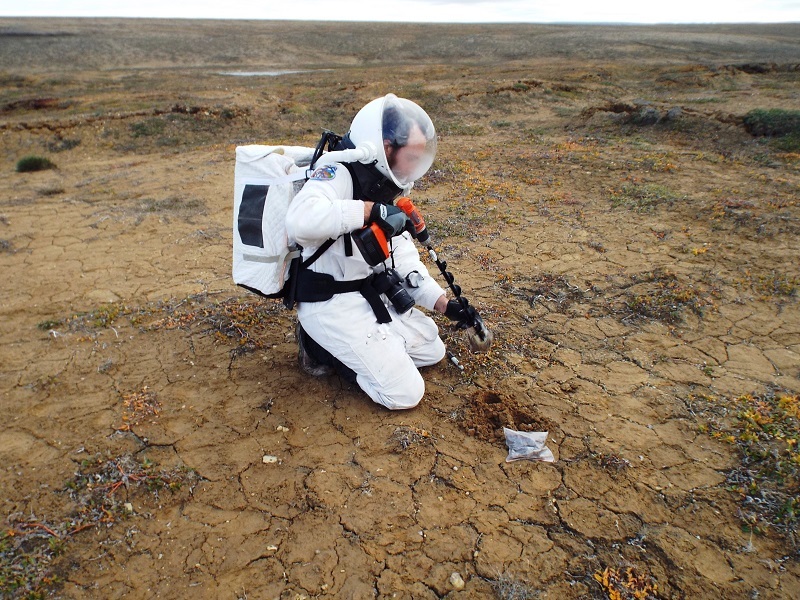 geological samples and observations along Haynes ridge SW of the hab. 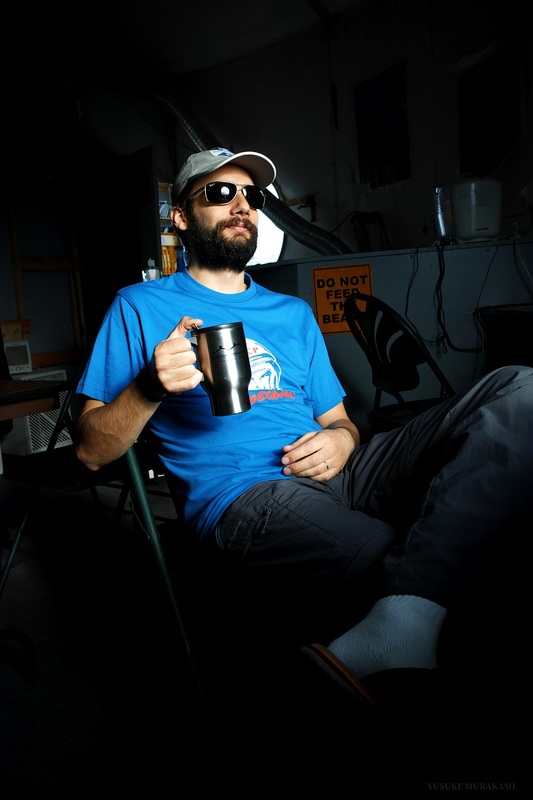 The crew morale is very good today. We had a wonderful evening yesterday (a lot of laughs). The weather is finally improving. A long EVA today. Jon, Paul and Yusuke have been to the mega polygons locations. 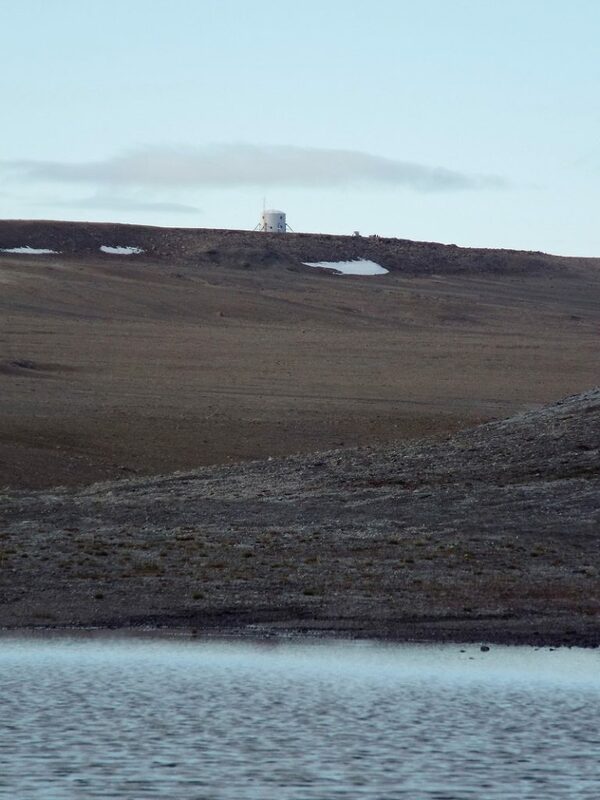 The location where Paul was supposed to install his probes, but could not because of ground conditions. They currently on their way back, expecting them in 15 minutes. We are expecting Paul with large smile since he finally got where he wanted to go. We finished the second drum of fuel today. Our fuel consumption has increased a little compared with the first drum.